So, folks, here it is, my book on the capability approach that has been in the works for a very long time. I’m very happy that it is finally published, I am happy that you can download the PDF for free at the publisher’s website, and that the paperback version is also about half the price of what a book with a university press would cost (and a fraction of the price it would cost if published by one of the supercommercial academic presses whose names shall not be mentioned here). I am not going to sell you my book – in a literal sense there is no need to sell you anything since you can download the book (as a PDF) for free from Open Books Publishers’ website (and I have no material interest in selling you hardcopies since I will not receive any royalties). And in a non-literal sense I should not sell this book either, since it is not up to me to judge the quality of the book. So I’ll only make three meta-comments. First, this book doesn’t quite fit the regular genres. It is not a textbook in the traditional sense of that word – surveilling and explaining the literature and adding some structure and comments. Instead, the book starts with presenting a generalisation of the capability approach. It gives the reader an answer to the question “What the heck is this thing that people call ‘the capability approach’?” I offer a ‘model’ that gives us the structure of the capability approach, which I call the modular view. In a nutshell, the capability approach can be seen as a framework consisting of a combination of three types of modules: the A-module which consists of core properties that each capability theory/application should have, the B-modules in which each capability theory needs to make some choices but there are various choices possible (example: the purpose for which one uses the capability approach), and the C-modules, which may or may not be relevant depending on the purpose of one’s capability theory/application (example: choice of measurement techniques). In the book, I give a list of what I believe the properties in Module A, and the various B-modules and C-modules of the capability approach are. This modular view is a new way of understanding the capability literature, and if it works the way I hope it will work, then it should help scholars from a wide range of fields to see better how they can use the capability approach for their own purposes. This modular view of the capability approach is new, and if it is convincing, it also has implications for existing work in the literature (for example, some claims made by some (eminent) capability scholars are not true if my view is right). On the other hand, the second half of the book can be read as a “frequently asked questions” on the capability approach. Is it a liberal approach? Is it too individualistic? How does it relate to human rights theories? What impact could it have on welfare economics? Is it the same as the human development paradigm that has been championed by the UNDP? Clearly, providing answers to these questions has a strong explanatory flavour – so in that sense it does have a textbook character. Perhaps we could categorise this book as a TextbookPlus. Or perhaps a word exists for this type of books that I do not know? Second, I have been surprised, when writing the book, how much the multi- and interdisciplinary nature of the literature on the capability approach has played a role in the clarifications that are needed in this literature. Scholars and students from different disciplines are often not properly understanding eachother, and at several moments when writing the book I felt like I was the middle-woman between the philosophers/political theorists and the social scientists (including economists), trying to explain to each party how the other party uses certain terminology and why they have certain scholarly concerns. I did not intend to take on this role when I started writing the book – it just had to happen. Finally, I really care about covers (Harry knows since I’ve often told him how much I like the cover of his book ‘On Education‘). For most academic books, the cover is the main place of aesthetic freedom and expression. The cover of my book is a picture of a piece woven by my oldest son Aaron (a few years ago). In my view, it perfectly fits as a symbol for what the capability approach stands for – stressing the multidimensional nature of human wellbeing and freedoms, as well as the many ways in which different dimensions (functionings) can be put together to form something that is bigger than the elements taken separately. Just imagine one of those colours being taken out: it would look quite different. The same is true if we leave out essential dimensions when evaluating human lives and thinking about how to organise societies, which is what much work in the capability approach is concerned with. It sounds great, Ingrid. I look forward to reading it. The points addressed in 2 above sound particularly nice to me. Congratulations! Look forward to reading it. Congratulations, Ingrid! The post is informative and attractive and the book sounds and looks great -the cover is beautiful. Congrats. Sounds v. interesting, and must be nice to have it out after a long period of work. Thank you, I will read your book! Congratulations Ingrid! I look forward to reading your book and to our future philosophy/psychology collaborations. I don’t think we have a term for the ‘textbook plus,’ but I agree that they’re a thing – the crusading textbook, introducing the issues whilst making distinctive contributions – and also that they’re something to be encouraged. I can’t think of many examples (within political theory) – apart from Kymlicka’s Contemporary Political Philosophy perhaps? Kymlicka citation is a good. P. S. Unless the second edition is cleaned up. Does OUP care about its reputation? Congratulations on writing this very clear book Ingrid. Reading it, and especially section 2.7.2 B2 and B5 on the selection of dimension and agency, section 4.5 on the role of the government in the capability approach and again section 4.6 on individualism, a question occurred to me and I wonder if you would like to share your answers with me. Simply put, who do you take to be the implicit we in the capability approach? To be more specific, consider the following quotes (my emphasis, all the time) “We need to specify which capabilities matter for our particular capability theory. [T]he dimensions that one selects to analyse will determine what we will observe — and also, equally importantly, what we will not observe since the dimensions are not selected.” (p.61) or “[T]he capability approach tells us what information we should look at if we are to judge how well someone’s life is going or has gone” (p.85). These quotes seem to presuppose that there exists an agent wielding the capability approach to a certain end, namely to evaluate “how well someone’s life is going” or to make certain observations. To be concrete, and to clarify the motivation behind my question, let us imagine an analysis of the relative repartition between paid work, unpaid work, physical care and emotional care between the two members of a couple. Then it seems to me that a good deal of the normative outcome of a capability approach analysis will depend on how dimensions are selected, and especially on whether the dimensions are selected and possibly weighted by one member of the couple alone or according to a certain decision mechanism between the two (and then again, which one?). In fact, I’m not even completely convinced that it is permissible or moral for one of the member to conduct a normative analysis of “how well [the other member]’s life is going”. (What if the analysis concludes that the other person is doing superbly, or miserably, and that does not correspond to the other person experience?). Perhaps one should conduct such an analysis only for oneself. Of course, this is a problem that exists more or less under an identical form for any normative analysis of individual well-being, but I think the question is particularly acute for approaches that pay great attention to human diversity and conceptualize each person as a specific end, so by definition for the capability approach (and to be clear, these features of the capability approach are also what makes it appealing to me). I’m looking forward to reading this. z @ 10 – very pertinent question. I think my analysis is mute on the question who ‘we’ is. It is assumed there is a “we” (it could also be a single “I”) and that this is taken as the point in the judgement/evaluation when the capability approach enters the stage. I think there is a parallel with a comment I once gat, namely that there should be a B-module “one’s audience” – for whom is one making the judgement/analysis? I didn’t want to have a proliferation of modules, and hence have included that (I believe!) in the B-module “the purpose of the theory”, which is not just what one aims to do, but also for whom. It could then be added here, that one should also make a conscious decision on who should conduct the capabilitarian analysis. And clearly, there are reasons, such as the ones you give, why it may matter a lot who does the analysis (other reasons come from standpoint epistemology which, in a nutshell, would claim that those with particular experiences in life are more likely to have better access to different types of insights, or, on the activist front, from the disability activist who have as a slogan “nothing about us, without us”.). So the choice of the ‘we’ is also a normative (or ‘political’ choice). thanks all! If you ever find time to read the book, feel free to send me comments – I’m eager to learn (such as from Z’s comment) what questions or issues remain unsolved or unaddressed. Though, sadly, with the exception of one small footnote the book seem to exclude investigating capabilities in relation to the 100 billion or so land animals exploited and killed by humans for food each year – despite there being relevant literature to cover. Given that limitation the book title would be more truthful if prefixed with “Human”. ccc – yes, that’s a valid critique. If I had thought about this earlier, or if anyone had told me so before we finalised the title, I would probably have added “human”. I should have added: I have deliberately chosen not got cover non-human animals, simply because I don’t know that literature well, and I had to make choices in order to keep this feasible for me (the book has been under contract for more than 5 years, and I started working on this book about 12 years ago, but the literature kept evolving and I kept thinking new things about the general anatomy of the capability approach). There are other literatures related to the capability approach of which people will complain that that literature is not really covered in the book – but I am honest when I say that if I hadn’t focussed and made some choices on what to cover and what not to cover, there would not have been a book at all. 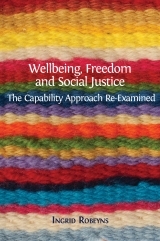 For anyone pointing out what is missing: the goods news is that there is a handbook on the capability approach forthcoming with CUP edited by Enrica Chiappero-Marinetti, Mozaffar Qizilbash and Siddiq Osmani. Much of those literatures should be covered in the many chapters to that handbook. Thanks for your answer, Ingrid. And congratulations again on completing this book. Ingrid #16 #17: Thanks for the reply. I should have also said this in my earlier comment: Your book takes on an huge amount of material as it is. And I don’t mean to disparage the content that is in there or the, no doubt, massive work you’ve put in to bring it all together. I hope the book becomes widely read and used. Gladly there are some signs of (slow) change now, thanks in part to the “political turn” in animal ethics pioneered by among others Will Kymlicka and Sue Donaldson. ccc #19 – thanks – this is very interesting but deserves a discussion in its own right – let me get back to this in a new post one of the next days. I don’t think we have a term for the ‘course book in addition to,’ yet I concur that they’re a thing – the crusading reading material, presenting the issues while making particular commitments – and furthermore that they’re a remark empowered. I can’t consider numerous cases (inside political hypothesis) – separated from Kymlicka’s Contemporary Political Philosophy maybe?